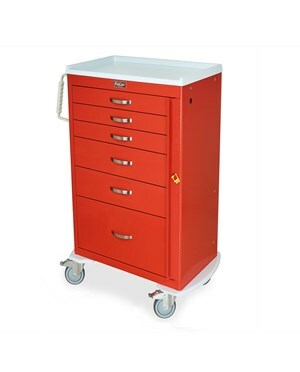 The Harloff Mini Line Tall Cabinet Drawer Emergency Cart is a medical storage device and crash cart with a space-saver design that makes it an optimal choice for hospitals or facilities with limited area. Compact, Spacious and Durable. Constructed with a width of 18", the Mini Line Tall Cabinet Drawer has a small form-factor that can fit into smaller areas but yet has abundant storage for even the most space-conscious customer. Made of steel and latex-free materials, this Emergency Cart has a durable, hard-baked powder coated finish that features ball-bearing full extension slides. The cart has a removable plastic top, included accessory mounting holes which are pre-threaded and a breakaway locking system with an included package of 100 plastic seals. The Mini Line Tall Cabinet Drawer Emergency Cart comes with a choice of either five or six drawers with 30" vertical drawer space. Hassle-free Transport. 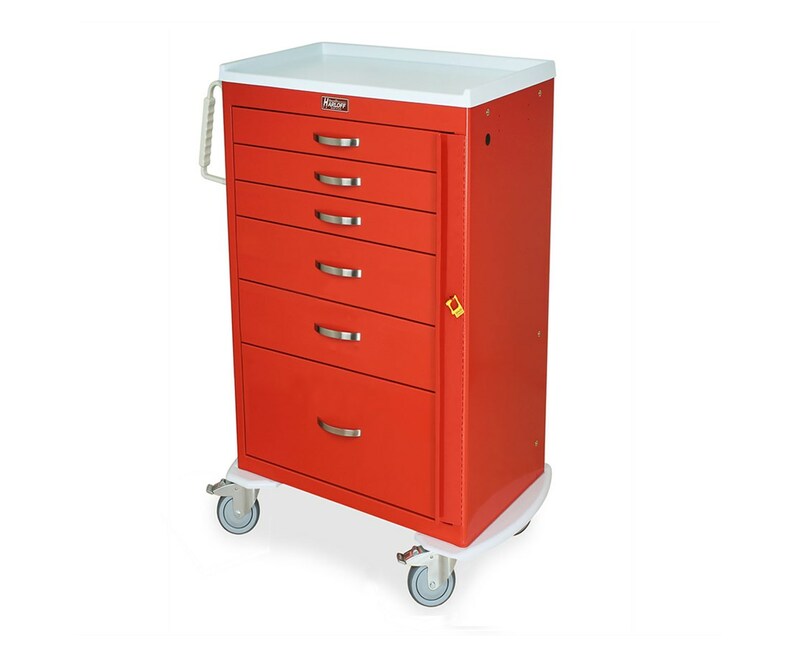 The Mini Line Tall Cabinet Drawer provides the user a choice to have the cart mounted on either 3" single-wheel stem full swivel caster system with two that brakes (3155B, 3155E, 3155K, 3156B & 3156B-EMG) or 5" ball-bearing full swivel caster system with one that brakes and one directional (3256B & 3256B-EMG). If the 5" caster system is chosen, it comes with a Protective Pontoon Side Bumpers. Drawer Size & Quantity: Two - 3", One - 6", Two - 9"
Drawer Size & Quantity: Three - 3", Two - 6", One - 9"
Drawer configurations: (3) 3", (2) 6", (1) 9"
Width 18" or 24.5"; 3200 series: 19.5" or 24.5"
Depth 18" or 20.5", 3200 series: 25"